A while back I was looking around for a quick connect for my Evanix Rainstorm .22. I've had this one heavily modified and this is the only real hitch left to complete the transformation to something I could have only dreamed of owning not so long ago. I'd contacted PA (Pyramid Air) about it but PA told me that they don't make a quick connect with a male adapter for this particular model. Undaunted with a "No, can't be done" answer, I search the net and actually, after some inordinate amount of time, just me and Google, ran across something that was viable and designed specifically for this purpose. But now I can't seem to find it. This is turning out to be an elusive creature much akin to Big Foot---there but can't been seen. 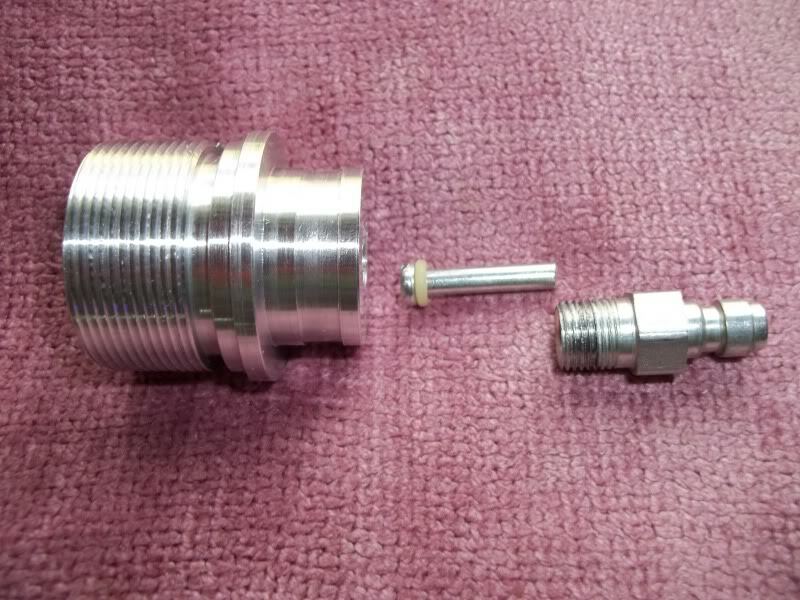 Doe anyone have an idea about where I can find this aftermarket add on that changes the fill probe to a quick connect with male adapter? Be advised the normal aftermarket application that works on most other brands like Career and so forth won't work on an Evanix Rainstorm. Something about the way it is constructed. Any help in this endeavor would be greatly appreciated. Thanks in advance of any consideration or reply! Evanix Rainstorm quick fill adaptor. I am new here, this is my first posting. I found this site today while researching Evanix Rainstorm, and noticed your post about the quick fill. They seem to have the fitting your looking for. But more importantly, THANK YOU! I looked and looked and looked. Knew it was there SOMEWHERE, you know? Post a spiel about yourself in the welcome range for those that don't know you already? Hope the link was helpful. I am looking at purchasing a "Evanix Rainstorm" and if it performs well, sending it to "Saddle Mountain Gunsmith" for the carbon shroud and tune. What do you think of the Rainstorm, out of the box and after mods. Plus what mods have been done to your Rainstorm. Oh, gosh, Rick, the list is long and extensive. No matter what I try to do I'll end up leaving something out, for sure. And no, I don't mind you asking: That is precisely the kind of thing we are into here. Don't mind at all. You should read this post: Longer Shroud for a Rainstorm for an overview. Pretty much the same thing that was done to the Infinity was done to the Rainstorm if not more. Out of the box the Rainstorm is an excellent performer. It is nicely balanced, has a smooth cocking action and is very accurate in a wide range of pellet choices.I like the 10 round magazine that isn't like the M-rod: the mag has an "O" ring around it that grabs the pellets so that you can load a mag and carry it in your pocket unlike the Sumatra that, by most all others in comparison, is sort of a backward insertion with nothing but seating pressure to hold it in place. You can load a RS mag in seconds and carry three around with you. Shooting lighter grain you could carry four and have the air to push them too. But, as you can see on the post I referred you, three, and that is *30* shots my friend, is enough. Since you get two with your purchase of a RS you only have to buy an additional mag and they are only $17 at PA before shipping and handling (not bad, really). But the versatility of the RS and what rounds you can fed it, again, is remarkable in that you don't have to compensate that much in the difference of grain with your zero. Of course, the heavier your round is the more of a rainbow arch you will have in the trajectory as with all grain no matter the make or model. If memory serves, I've got a 3-12x56 AO scope on mine and, as sure as I'm sitting here, if I can see fur I've got a shot at what I'm aiming at! Most of my targets are an over population of squirrels around our very established neighborhood and these tree rats are masters at tree hugging, one eyebrow over the big branch to peek at you and, if they do, I can nab 'em. Very seldom do I miss and when I do it's more than likely operator error but I've never hit anyting I wasn't supposed to hit. These past few months I've taken to using only 3x or 4x power to aim. Gives me a better and wider area to keep up with them as they travel that in the tree highway that they have up there. Too bad I can use this one in a Bench shoot contest: To much power but at 20 meters there'd be no effort at all to X out the bull's eye. 1176 fps w/11.9-gr Hobbys; 860 fps w/28-gr Eun Jins. However, if you have gone through the paces and paid your dues with Will Piatt, and if you will notice the Chrony figures on the post I referred you to earlier, you'll see that you can get much better FPS and, obviously, better FPE. Trick is getting the FPS to match up with the pellet you are shooting. And don't miss the fact that you can adjust the tension on the hammer to go up or down in power. I have mine set perfectly for what I shoot out of it. I've found that I'm really happy with the Kodiak. However, my first day with my RS, and not ten minutes after zeroing in the scope at 35 yards (my favorite zero being that this is the length of my at home range) I was called to help take out a rouge raccoon. First shot with the 28.5 Eun Jin was up the chin and out the back of the top of the skull from about 20 yards. He killed over and piled up on the ground. That's a LOT of fire power for back yards. But with the Kodiaks, as you can see by the targets chewed up on the earlier post about this, this thing is a tack driver at 35 yards.But it wasn't quite like that when I first got it: The grouping wasn't near as tight as before Will Piatt at Saddle Mountain Gun Smith got his paws on it. And, just so you know, groupings for the Eun Jin Pellets tightened up as well. These pellets preform will at 900 to a little over 1000 FPS in my experience, depending on what you are using to shoot them. To sum it up, out of the box this is a right nice Air Gun and, unless you are really serious about making precision and surgical shots like I have to do in a very populated area, you can actually leave it as is. I have no doubt that a well placed shot from my RS would take out a small deer or coyote with the Eun Jin 28.5 grain round nosed conical. I have no problems dispatching squirrels and, as stated, even a Raccoon. But for lighter game around here I stick with the Kodiaks but if I were going for the bigger stuff like medium game, I'd go with the Eun Jin. I don't think I'd switch up to go for rabbit though. These are powerful well made guns with excellent fit and finish. They have quality choked barrels and are usually very accurate with a variety of pellets as long as the velocity is matched to the pellet weight. Recommended .22 pellets are Eun Jin, Kodiaks, and JSB 18 gr. Noise suppression system. Especially helpful on the short shroud Rainstorm carbine and Windy City. Replace shroud internals with precision turned baffles and add a rearward air diverter. Vent muzzle shroud support for better air flow. Install machined aluminum depinger. Do a trigger job. Machine 2 magazines for a second o-ring to prevent short pellets from getting skirt damage if they back out under recoil. Set power level to customer specs over Chrony. No need to ship the stock, save on shipping costs and risk of stock damage. Many customers have new rifles drop shipped from their vendor. Price for complete tune is $120 plus return shipping. Shroud baffles, spacers, air diverter, and vented shroud support $55 shipped (requires measurement of shroud) Note the shroud support is locktited on and requires heat for removal. Shroud internals without the vented muzzle shroud support $45 shipped. Machine Magazines for second o-ring $10 ea. 3” Longer 100% Full Carbon Fiber shroud and complete tune $250. Beauty and Function. Now, I did have a problem with my regulator. It went out on me about a year after I'd bought it and fed like zillion pellets to it. I didn't fuss with it at all. I sent it straight to Will and he fixed it better than new. I'd have to Q&A him on exactly what he did. I never question him and pretty much give him command decision what he does with my gear. When you find someone like Will that you can trust, you don't have to worry about covering the bases: He will and this I can attest. Too, about a month ago I took a bad fall. My RS went one way I and went the other resulting in a bad split of the stock. I've sent it back to Will for him to fix it. There was a time in my life I could have done that part but, these days, that sort of thing is better left to professionals like Will. Currently I've got an email in to the site you offered, and, thank you for that again, by the way. I'm eager to get a response from BGMF Airguns THE HOME OF THE GARGOYLE RIFLEto see if he actually has those foster fittings available. For $50 bucks, advertised on his site, I can't see NOT getting this final mod for my RS. I've also asked Will if this is something he could make or would offer. He's cut a LOT of weight off the RS by switching it to the carbon fiber shroud and I'm thinking if he can make one very light, I might go with what he can do or wants to try. Neither BGMF or Will has gotten back to me yet. I I end up getting it from BGMF I'll just ship it to Will since he's still got my RS at the moment. Hope this helps you with what you wanted to know. If not, ask again and I'll be more specific about answering your question. But if you can't tell, my RS is my favorite go to Air Gun after my Walther Falcon that isn't as near as accurate but the Walther never needs refilling! Nevertheless, in a nutshell, buy it first off. You won't be sorry. Secondly, do send it to Will. Again, you won't be sorry! And last but not least, when you get it, and I have a feeling you will, don't send it straight off to Will. Take some time with it, get to know it as each AG has it's own character and quirks you'll have to make friends. When you have done this, THEN send it off to Will. This way you'll really be able to appreciate Will's work and the improvements. Keep us updated on this and when (not if) you get yours. I'd like to hear your thoughts on this fine piece of hardware as well. I have already seen the Pyramyd Air video, and visited Saddle Mountains site, was mostly looking for your feedback, since you have a Rainstorm done by Will Piatt. I think the Rainstorms magazines are a deal, at least compared to my BSA and Daystate mags. When and if I purchase one, I will be sure to give an update on here. Great then. I take it that you got what you needed from it. But don't forget what is posted is for everyone out there since we are global, not just for us. Some haven't been to PA or know anything about it and I'd like to keep them in the loop, as it were, as well. I'm eager to hear how things work out with your purchase. BTW: I did speak with Will Piatt and he's going to make me one of those foster fittings. He's going to make one for himself as well. You may want to speak with him about it when you get the chance. I haven't gotten a reply back from BGMF: It's the holiday season so I don't expect a reply, realistically, anytime soon. Regardless, I hope the latter is good information for you as well. Good luck and shoot straight! You saw it here first, folks! Will Piatt at Saddle Mountain Gunsmith is offering these for the Evanix Rainstorm. He makes them custom. I haven't heard back from the other site I originally saw one of these but I know for a fact that you can get one at Saddle Mountain Gunsmith. I've already got my order in and paid for it. Should make life easier with switching fittings all the time. All my other air guns have the quick connect on them so now they ALL do!